Not everything at the Macworld/iWorld show floor will amaze you. But the set of four iPhone apps on display at the Rostami Magic booth probably will—and maybe then entice you to spend some cash in the App Store. The apps let anyone perform magic tricks with their iOS devices. Rostami’s newset app is iTelekinect, which lets you move objects—and even your iPhone itself—using only the power of your mind. The $1 app doesn’t just let you make inanimate objects move with your mind; you can empower your friends to do the same. 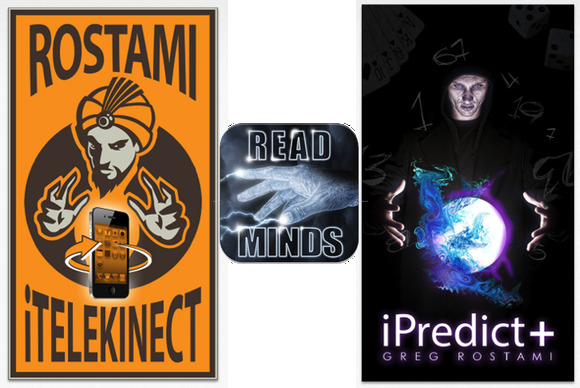 That app joins a trio of other Rostami Magic tricks. iForce, a $3 app, includes multiple magic effects. It’s a customizable trick; anything you can draw on your iPhone’s screen, you can use in your prediction. In the demo I saw on the show floor, the magician used the app to predict which denomination of dollar bill I’d remove from my wallet, and where I’d leave my finger as I drew loops around an iPhone. iPredict+ is another $3 app. This one actually lets you work your trick using someone else’s iPhone. When I saw this one demonstrated, the trick worked like this: I picked a card from a shuffled deck and didn’t reveal it to the magician. He told me about his fortune-telling friend, and showed me her contact information in his iPhone. At his urging, I called from my phone; she didn’t answer, but on her voicemail greeting, she correctly stated that my card was the ten of spades. Dead Magician is a $1 app, and it works largely the same as iPredict+, only instead of calling your friend, you call, well, a dead guy. Both apps also let you find the selected card by texting your friend/a dead illusionist, too. A good magician never reveals his secrets—not without payment at least. And you’ll find out how each trick works when you buy the corresponding app.